On the recommendation of a fellow foodie, with our appetites whetted for tasty fare made with locally sourced ingredients, we ventured into a dimly lit restaurant with a large open kitchen dominating on the left and a row of tables on the right. 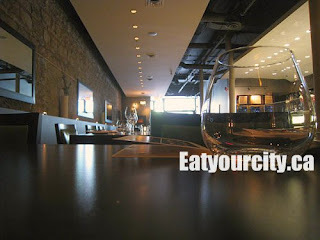 Though we arrived early, the chefs, sous chefs and kitchen staff were already working in a frenzy of motion, dishes clattering with all sorts of tantalizing scents drifting over to the sitting area. In an odd way, you feel like you're sitting in someones living room and looking into their kitchen - there is a colorful wall of homemade pickled peppers and assorted vegetables (not just for show as we found out later), platters of crustinis and flatbread on the counter, and lots of shiny pots and pans. Antique weathered doors adds a bit of rustic charm to the brick walls, and other minimalistic art pieces gives a warm welcoming feel to the seating area which has chic dark tables and seating. Service was excellent, with our waitress having a good knowledge of not only what was on the menus, she also was knowledgeable in pairing some of the wines on their laudable wine list to the various dishes we chose. 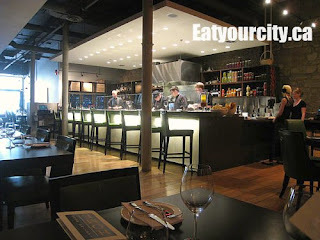 I was told Home Tasting Room was a place for tasty food, wine and tapas. Thankfully, they don't do the tiny bite or two of a Spanish or fusioned dishes. 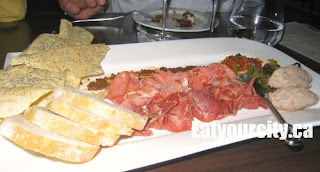 The tasting plates vary in size (one bite to several bites per person - we had a table of four) and are conducive to sharing. It has the advantage of not only allowing patrons to graze their way through Home Tasting Room's entire menu... you have an excuse to try more wine pairings! While all the wines are available by the glass or bottle, they have several reds and whites available in a small 2oz portions. So if you're new to wines, or an avid wine connoisseur, its a great way to try new wines, and you don't necessarily feel too bad ordering another small glass of vino if you've tasted it and want something sweeter, fruitier, drier etc to go with your food. 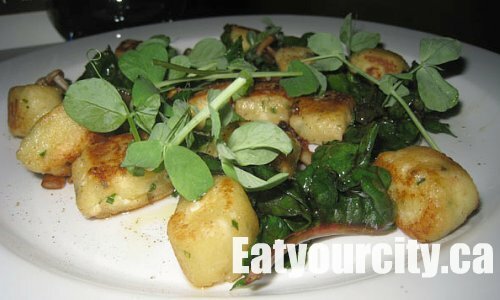 The small cylindrical cubes of potato gnocchi is pan fried to a golden brown perfection and served with sauteed tinny tinny beech mushrooms, warm wilted Swiss chard and laced with Parmesan oil. The bite sized pieces of gnocchi have a crisp almost crunchy exterior which contrasts with the bouncy mouth feel when you bite into the center. It was a pleasant surprise as I was expecting a soft almost smooshy interior characteristic of traditional gnocchi. The tender crisp beech mushrooms and Swiss chard add in a punch of flavor and texture, while the light Parmesan infused oil ties all the elements together. The dish was only lacking a sense of brightness - the gnocchi, chard and mushrooms all being sauteed and coated in flavored oil while tasty, was a bit on the heavy side. A dusting of lemon zest or small hit of acidity would have elevated this into a more cohesive dish. 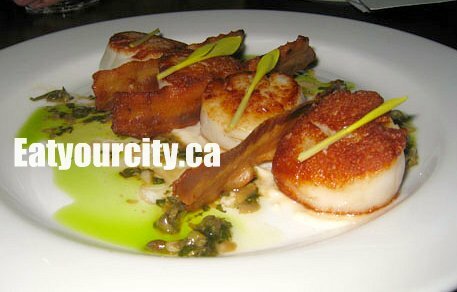 Seared to perfection with a super thin and light golden brown crust, these fat scallops were gently seasoned to enhance and not take away from the delicate sweetness inherent in fresh scallops. The crisp slices of in house made bacon, cauliflower puree and anchovy pesto seemed extraneous as the scallops stood well on its own. The bacon while crisp, was heavily salted as I suspect it was fried and not crisped up slowly in a pan, then again, I'm preferential to bacon with sweeter notes like applewood smoked varieties; the cauliflower puree while creamy and light - its purpose seemed more to balance out the salty anchovy pesto the scallop rested on. Despite all the the salty notes, it didn't stop me from wanting more scallops after they disappeared off the plate. The corn minigreens added a nice fun note - a bright taste of raw sweet corn. I'm a sucker for tartars - yes, the meat is raw, but when prepared with plenty of love and spices, its a smile inducing symphony of flavors and textures. 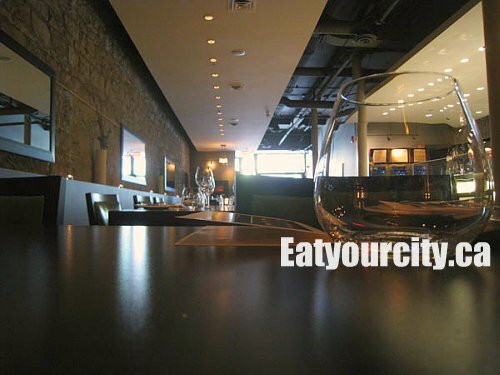 Home Tasting Room's version is made with bison, lending a softer silkier texture to the tartar than with traditional beef. They also interestingly leave the bison to speak for itself, as the tartare leans towards the sweet side with subtle notes from herbs blended in. Its served with cheese crustinis slathered generously with a truffle oil laced alioli. We all agreed that the tartar, though delicious as is, would have benefited from something to add a bit more texture and a salt note to it - like adding in a fine dice of their inhouse pickles or capers. 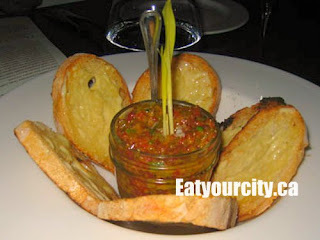 The scent of truffles hung in the air as we made short work of the little jar of tartar... mmmm. A large platter lavished with piles of finely shaved meats all made inhouse, with inhouse pickles and yup, you guessed it, inhouse mustard to accompany everything. Shaved paper thin, piles of lean bison, elk, pork and beef based hams, and sausage along with a pork pate grace the large platter and pair well with the tangy salty sweet inhouse diced pickles, pickled green beans, and to our delight even pickled fiddleheads. I could have spread the earthy sweet mustard over everything, but only a good sized glob was on the platter, so had to share. A standard crisp seed riddled flatbread and slices of french bread is available as a foundation for you to pile up your meaty creations. Although an actual entree "large dinner plate", this dish was easily sharable, though after the first bite, I think there was a small part of us where we all were reluctant to continue sharing. 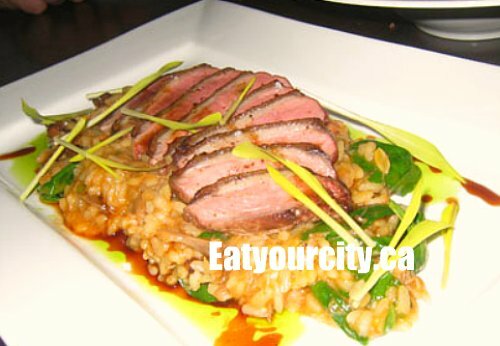 With a light crispy skin, cooked to a lovely medium rare, and picking up flavors from the risotto, it was no surprise the duck breast slices disappeared quickly. The cassoulet risotto almost eclipsed the duck however -intensely saturated with red wine, duck broth, diced pieces of ham/thickly cut bacon?, and various diced vegetables, I would have been perfectly happy with eating a gigantic bowl of this creamy risotto every night for the rest of my life. A must try. And next time, I'd be very tempted not to share... its that good. 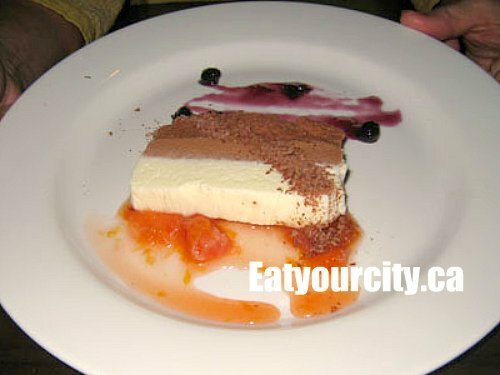 Essentially a layered tiered chocolate mousse made with Valrhona chocolate dark, milk and white, its garnished with a tasty sweetened blood orange sauce and a berry reduction. The mousse though made with delectable Valrhona chocolate, was fluffy and had a bit of a gritty texture. Having experience making chocolate mousse myself, its rare to execute a mousse without a slight bit of graininess as melted chocolate fiendishly loves to crystallize as one tries to incorporate it into the heavy cream. Still, I'll continue to search for the perfectly executed chocolate mousse. Small quibble - the plating needs a bit of work for this dessert as the sauces seemed a bit muddled on the plate. Garnished with a super thin vanilla wafer, I wondered briefly how they managed to insert it and flame the sugar without burning the wafer. While pretty, it doesn't add much to the creme brulee. The sugar topping was nicely caramelized almost to the point of burnt, and was a bit thicker than what we expected - took a bit of stabbing with the spoon to crack through the burnt sugar topping. The creme brulee had a intense blast of sweet berries from the berry compote nestled in the center of the creme brulee, hiding underneath the burnt sugar layer. The remaining creme brulee was silky, creamy indulgent goodness. 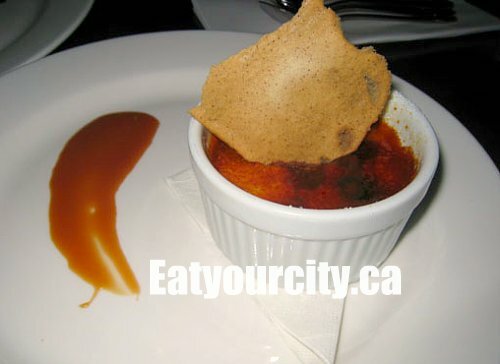 After polishing off all the berry compote, the remaining creme brulee paired nicely with the slash of buttery thick caramel sauce on the plate. Mmmmmm. Executive Chef Geoff Rogers showcases a lot of talent and his great sense of matching flavors and textures at the Home Tasting Room. Creating almost all of the charcuterie's meats and pickles inhouse along with using an array of locally sourced ingredients shows a devotion that shines through in the food. Aside from a few execution lapses, the Home Tasting Room is definitely not a place you want to pass up. After all, you're sitting in Chef Roger's tasting room.